Retired by CollectA - Get yours while supplies last! CollectA - Arabian Mare - Golden Chestnut. 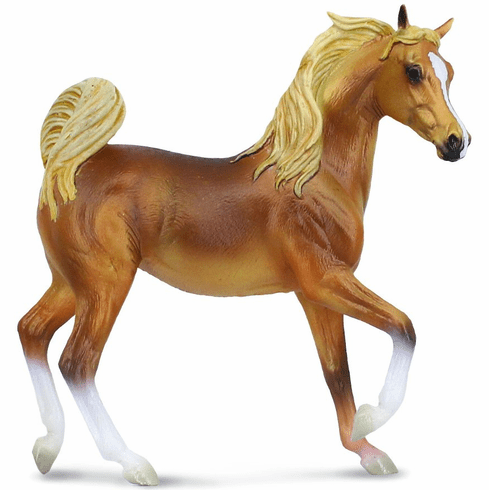 This true to life, scaled-down Arabian Mare - Golden Chestnut is perfect for use in dioramas and other display projects. Excellent for educational purposes, and gaining deeper knowledge of actual animals. As one of the major architects of toy animal replicas, CollectA uses role-play for learning: our mission is building a natural world in miniature. Suitable for Ages 3 and Up. Measures approximately in inches: 6.5 L x 4.3 H.
Part of the Horse Country Series by CollectA. Hand Painted.